There is an implicit assumption in all that follows that uncertainty can be measured by probability. There is a very good argument that probability is the best measure of uncertainty.1 A clinician is uncertain of the diagnosis, given symptoms displayed by the patient or of the prognosis that follows from the diagnosis. Uncertainty is colloquially presented in statements of likelihood. 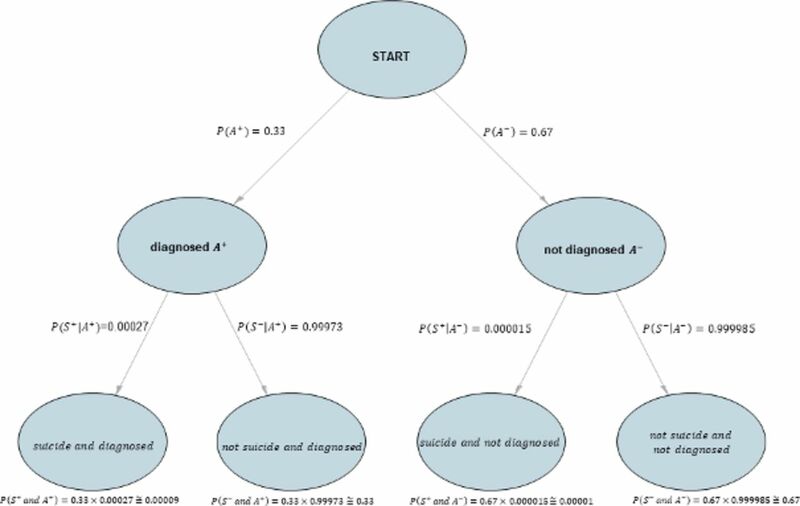 For example, it may be stated that ‘it is very likely the patient has a particular disease’ or ‘it is very likely that the patient will die within a certain specified time period.’ This paper assumes that such measures of likelihood can be represented numerically by a number between 0 and 1, a number which is known as a probability. In other words, probability represents a measure of belief. There is a fundamental theorem underlying reasoning under uncertainty. The theorem is Bayes’ theorem, named after a non-conformist theologian, Thomas Bayes (1701–1761), who was a student at the University of Edinburgh and a Fellow of the Royal Society. Bayes’ contribution to science was twofold. First, he argued, as above, that uncertainty about the occurrence or otherwise of an event can be represented by a probability. Second, he showed through his theorem how one’s uncertainty about the occurrence of an event can be revised in the receipt of evidence or information of relevance to that event. These contributions are applicable to medical reasoning. First, the event, about whose occurrence or not the clinician is uncertain, is a diagnosis or prognosis. The information of relevance to this event is a symptom in relation to a diagnosis or a diagnosis in relation to a prognosis. Two examples show how these ideas work in practice. Throughout these examples, the exact numerical figures are not important for the argument concerning the interpretation of evidence. It is the underlying principle that is important. In both examples, the probability of an event is updated in the light of new evidence. Conditional probabilities are easily misunderstood and prior odds of an event should be taken into account when trying to interpret them. A common problem arising with interpretation of conditional probabilities is known as the prosecutor’s fallacy 2 from its misuse on criminal cases where a small probability of finding evidence on an innocent person is confused with the probability that a person with whom the evidence is found to be associated is innocent. This confusion is not specific to criminal cases and this may be further clarified with the following comparison. I have two arms and two legs. If I am guilty my DNA matches that of a profile from a crime scene stain. If I have the disease then the test result is positive. If I have two arms and two legs am I then a monkey? If my DNA profile matches that of a profile from a crime scene stain, am I then guilty? If the test result is positive do I then have the disease? In all of these cases, the first statement in each column is true, assuming no false negatives. However, the answer to each of the questions in the second statement in each column is ‘maybe’. This example concerns the consideration of a prognosis given a diagnosis. It is possible to use measures of belief such as personal opinion, based on experience, for example, as probabilities in the reasoning. However, if data are available to inform these beliefs it is sensible to take advantage of these data. For this example, the following data are available. , hence approximating 1.2 in 10 000 with 1 in 10 000 for ease of explanation. Uncertainty about whether a person will commit suicide or not is represented by a rate from a survey. In the absence of any appropriate survey, the uncertainty can be represented by a measure of belief expressed as a probability.
) is 0.9 or 9/10 or 90%’. It is important to note that while 90% of those who committed suicide had been diagnosed with a psychiatric disorder at least once in their lifetime it is not the case that 90% of those who have been diagnosed with a psychiatric disorder at least once in their lifetime will commit suicide. However, the probability of interest for the diagnostician is not the probability that a person who has committed suicide has been diagnosed with a psychiatric disorder. It is the transpose of this, namely the probability that a person will commit suicide if they have been diagnosed with a psychiatric disorder at least once in their lifetime. Given the probabilities above, this probability of interest can be determined. The information available is listed below. : a person will commit suicide. : a person will not commit suicide. : a person has been diagnosed with a psychiatric disorder at least once in their lifetime.
. The corresponding general result is that the sum of the probabilities of mutually exclusive and exhaustive events is 1.
. Figure 1 shows a probability tree diagram for this example.
. If such a person has a diagnosis of a psychiatric disorder, the odds in favour of committing suicide (posterior odds) increase by a factor of 2.7. )), which is certainly an unrealistic probability for a person in the general population about whom nothing is known to commit suicide. All the probabilistic measures entertained in this example are presented in table 1. The information available is summarised below. : a person has schizophrenia. : a person does not have schizophrenia. : the laboratory test has a positive result. : the laboratory test has a negative result. : sensitivity, the probability that a person with schizophrenia has a positive test result, here equal to 0.83.
: specificity, the probability that a person without schizophrenia has a negative test result, here equal to 0.83.
. The proportion of people with positive test results for both A and for B is not the product of the proportion of people with a positive test result for A and the proportion of people with a positive test result for B.
. Such a result would suggest additional positive results led to a decrease in the probability of schizophrenia. An explanation as to why this is not so is given in the following paragraph.
. Of that 18.6%, the number that has both schizophrenia and a positive test result to both tests is 2.45% of 83% which equals approximately 10% (0.83×0.024/0.186=0.107). The initial proportion of the population with schizophrenia was 0.5%. The additional information of a first positive test result has raised this proportion to 2.4% or an increase by a factor of 4.9. A positive result to a second test, independent of the first, raises the proportion to 10%. The probability that a person with a positive result to both tests has schizophrenia is 10%, compared with the base rate 0.5%, an increase by a factor of 20. Arguments similar to those in these two examples occur in the evaluation and interpretation of evidence in forensic science in the administration of criminal justice. Instead of presence or absence of a disease (eg, schizophrenia) or the fulfilment or not of a prognosis (suicide), there are two propositions put simply as the defendant is guilty or the defendant is innocent. In this context, these propositions are those of true guilt and true innocence, not the verdicts. ‘Guilty’ or ‘Not guilty’ of a jury. Instead of the test result (positive or negative) or the diagnosis (psychiatric disorder) there is scientific evidence. Consider the evidence that the DNA profile of a defendant matches in some sense that of a blood stain found at a crime scene. If the defendant were innocent, this match would be fortuitous and the probability of a match by chance would be very small. The probability of finding the evidence of a match if the defendant is innocent is very small. However, this probability is not to be equated to the probability that the defendant is innocent if there is a match of DNA profiles. More generally, the probability of innocence for someone on whom incriminating evidence has been found is not the same as the probability of incriminating evidence being found on a person who is innocent. The claim that these two probabilities are equal is another example of the prosecutor’s fallacy.2 Similarly, a large probability of a positive test result for someone who has a disease should not be equated to a large probability that a person with a positive test result has the disease. is needed. In a similar spirit, lots of medical journals, including BMJ, require that along with relative measures (eg, relative risks), absolute measures of the event in each group (absolute risks) should be reported.
. Understanding uncertainty, Revised edition. John Wiley and Sons Inc, Hoboken. USA: New Jersey, 2014.
. Cross-national comparisons of the prevalences and correlates of mental disorders. Bull World Health Org 2000;78:413–26. World Health Organization. Preventing suicide: a global imperative: World Health Organization, 2014. http://www.who.int/iris/handle/10665/131056. World Health Organization. WHO | Schizophrenia. Schizophrenia Fact Sheet. 2014 http://www.who.int/mental/health/management/schizophrenia/en/.